It's time to face facts. The man elected by 53% of Americans is not only a committed Marxist - he's an embarrassment to the country! Below is a group shot of world leaders taken at the UN on 9/20. 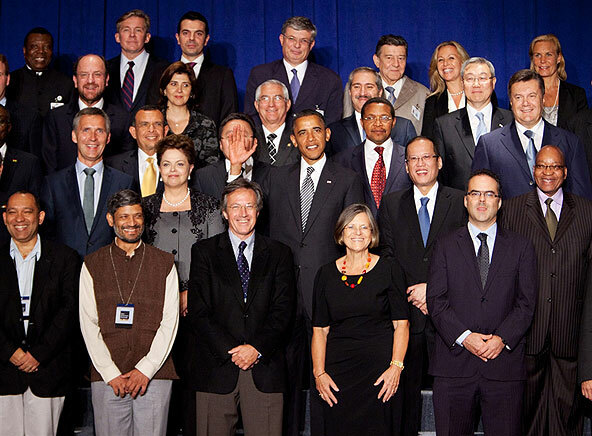 It is accepted protocol that you do not wave during these photo sessions because you might cover the face of a fellow leader. How about when Bush could not figure out how to get out a room LMAO. That I m sure you were not embarrased by, but some one raising there hand when they didnt realize a picture was about to be snapped. That you find embarrasin­g. other, just goes to show how petty and deceitful most right-wingers are also..
What can you except from a bunch of racist, bigot scumbags on the right? P.S. That photo ISN"T photoshopped, just sadly choosing wrong! Yes, he is an embarrassment but I'm not surprised that you don't see it. He didn't know they were going to take a picture? Why, pray tell, were they assembled if not for pictures? Did he not know where he was? That's even worse! I don't understand the beginning of your second paragraph. What could be real? The picture I posted? The picture is most definitely real. Obama did wave at the camera. Why is it that leftists always resort to name calling and racist allegations when they can't produce a legitimate argument? Perform a search for Allen West on this blog and read everything I have ever said about him. I would love for Mr. West to replace Obama. I also like Herman Cain but I really do not feel a need to defend myself against your baseless slander. Grow up. Study the issues our nation is facing and take a serious look at Obama's agenda. If he is doing the job you want him to do then I know you are a statist that hates America, our Constitution and individual liberty. You prefer tyranny. On the other hand, I prefer liberty and no matter the color of the president, if he defends my liberty, I will support him.